Home / 4x6 photo printer / Canon Photo Printer. / PM-520 / Small Photo Printer Epson PM-520 Vs Canon CP-1000 which Best? 4x6 inch photo size or commonly known as 4R is to crop it using a standard 4x6 inch inch size. About this printer is indeed quite tiring and dizzying. And you have to be careful or you just waste money. Small Photo Printer Epson Vs Canon CP-1000 Which Best? 1). Ink tank refill is not available in our city, making it difficult and finally buying, initial ink ink sold by the seller even though for advanced ink. 2). Printers that are only for 4x6 size printing and a maximum of 5x7 inches are certainly not able to print photos or other larger graphic media materials. Like the size of the A4 or F4 cover. 3) Price range that is quite expensive with ink tank refill is only 4 colors which if you have to replace it all even though there are still leftovers in certain colors. 4). 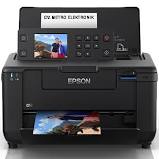 The same can be done by the Epson L310 printer, with 4 ink infusion refill ink, which is bottled ink can be filled one by one according to the ink that runs out and can be found in our small city. The problem of this printer must be careful, even though for businesses do not buy the printer many times at high prices, while the return of investment is fairly long to cover. It's good or at least as a backup, whether for a mini photo studio or photo printing business, buy an affordable printer, without ignoring the results. with a price range of Rp. 1,800,000, - refil in a year say, Rp. 600,000, - around Rp. 200,000.- up to Rp. 300,000 - quite affordable production costs. So that a photo printing business can be more profitable. Instead of buying a lot of printers but capital doesn't return.